Stewart Island offers walks for all different fitness levels and ability ranges where one can enjoy our diverse bush, birds, scenery and landforms. There are several easy walking tracks within the vicinity of Oban varying from 10 minutes to 3 hours. Of the short walks one of the most popular and rewarding would be Observation Rock, giving stunning views of Paterson Inlet and amazing sunsets. Longer walks include Golden Bay to Deep Bay, Ackers Point track for coastal vistas, Horseshoe Bay track, Maori Beach track and the popular Ryans Creek track. From the DOC Visitor Centre turn right towards the waterfront, continue right until you reach Excelsior Road on your right. Excelsior Road is an uphill climb, watch for the Observation Rock track sign on your right at the summit of the hill, a short forest track leads you to the rock forming the lookout, with great views over Paterson Inlet, particularly at sunset. To return to Halfmoon Bay retrace steps to the road and continue right, down hill towards Golden Bay Road. A right hand turn will bring you back to town past Traill Park. Turn left outside the DOC Visitor Centre along Main Road, take first left into Dundee Street, continue until the Fuchsia Walk sign on the right hand side. The fuchsia forest along this track attracts a variety of native birds. Once reaching Traill Park you can either return to the township via the road, or continue on to the Raroa Reserve track. The entrance is at the opposite end of the park and goes through unmodified forest for about 20 minutes, to reach Watercress Bay. Turn left to go back to the township. At the waterfront, turn right until you reach Ayr Street (first on the right). Follow this street (which becomes Golden Bay Road) for about 15 minutes, passing Traill Park and then downhill towards Golden Bay. On your left, you will see the sign marking the start of the track to Deep Bay. The coastal fringed forest track that joins these two bays winds, climbs and falls with lovely views of Paterson Inlet. The return walk to the township (approx. 20 minutes) can be through Deep Bay Reserve over Peterson Hill. The track joins Wohlers Road just before reaching Deep Bay. Alternately continue along the road from Deep Bay to Ringaringa (5 minutes), and Lonnekers Beach via the track returning to Halfmoon Bay (40 minutes). Follow the gravel road from Deep Bay to Ringaringa Beach. To get to Ringaringa Point either walk along the track in front of the houses or along the beach at low tide. The graves of Reverend Wohlers and his wife (early missionaries to the area) are situated under the large trees at the point. Return to Halfmoon Bay via the old Ringaringa Road (40 min) or there is a short cut to Lonnekers Beach (5 min) via the track or via Wohlers Road. At the waterfront, turn right and continue round the coast passing Lonnekers Beach. Reaching the top of the hill take the coastal road passing Leask Bay until you reach the stile, where a short track crosses private land to Ackers Cottage, one of the oldest buildings in New Zealand, this cottage was built in 1835 by Lewis Acker. Continue along the main track through coastal forest, past Fisherman's Point and on until you reach the lighthouse with great views out over the islands and Foveaux Strait. At dusk in mid to late summer Little Blue Penguins and Sooty Shearwaters (Titi or Muttonbirds) can be seen returning to their burrows around this point. From Leask Bay turn into Evening Cove Road and at the road end a track leads down to the beach. From this track a track also leads uphill to meet the Ringaringa Road. From the DOC Visitor Centre turn left and continue along the Main Road, taking the right fork at the Airstrip turn off, into Kaipipi Road, follow the gravel road until the large sign is reached for Ryan's Creek, Kaipipi and Fern Gully tracks. The Fern Gully track follows an old sawmill track winding along a stream, with a variety of beautiful ferns and cutover forest. At the end of the track there is a clearing where a welcome seat gives you a good opportunity to enjoy the birds and bush. Turn left outside the DOC Visitor Centre and continue along the Main Road taking the right fork at the Airstrip turn off along the gravel road, until the large sign is reached for Ryan's Creek, Kaipipi and Fern Gully. 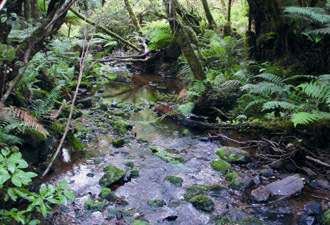 The first part of the Ryan's Creek track follows through cutover forest until you reach the estuary, an early sawmill site. The track from here winds, climbs, and falls through coastal vegetation. About 15 minutes from Thule Bay, Vaila Voe is reached where at low tide waders such as Oyster Catchers can be seen feeding on the mud flats. From Thule Bay follow the road back to the township. If you wish to take the longer option and continue to Kaipipi Bay, follow the track as signposted from off the Ryan's Creek track about 10 minutes from the Fern Gully turn-off. The track follows an old logging road which in the late 1800's was the best maintained road on the island, servicing two sawmills at Kaipipi Bay and employing 100 people. From the general store, continue left uphill on the Horseshoe Bay Road. 100 metres after crossing a small concrete bridge, Mapau Road turn off is on your left. Approx. 100 metres along this road a left hand turn along a small gravel road will bring you to the main Stewart Island Cemetery. From the general store, continue to your left uphill on the Horseshoe Bay Road passing Mill Creek, Butterfield Beach and reaching Bragg Bay turn-off to the right (20 minutes). Three minutes along this road on the left, the entrance to Moturau Moana native garden is reached, a nice peaceful setting with views over Halfmoon Bay. Allow extra time to explore this area. This site was gifted to the Crown along with a nearby section of unlogged forest, named after the benefactor, Miss Baker. From the general store, continue to your left, uphill on the Horseshoe Bay Road until you reach Horseshoe Bay (approximately 40 mins). Turn right and follow the coastal track to Horseshoe Point (30 mins). It is a great spot to view the comings and goings across Foveaux Strait. The track beyond Horseshoe Point towards Bragg Bay is not maintained. From the general store and uphill onto the Horseshoe Bay Road follow the road for approximately 1 hour and near the far end of Horseshoe Bay, turn left into Lee Bay Road. 10 minutes on, near the top of the hill a track on your left leads upwards to the summit of Garden Mound. The track descends and joins the track from Lee Bay to Maori Beach. A left turn here will take you to Little River, (5 minutes). Return along the gravel track to Lee Bay, then onto the road to Horseshoe Bay and eventually back to Halfmoon Bay. From Halfmoon Bay follow the road to the end of Horseshoe Bay and on to Lee Bay. From here pick up the track to Little River. Continue from Little River along the tramping track to Maori Beach, a former sawmill site. Return to Halfmoon Bay via the same track. 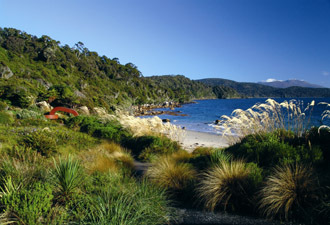 One of New Zealand's "Great Walks" is the Rakiura Track - a moderate 3 day, 36km track. Mason Bay is a popular destination with a number of options on how to get there. 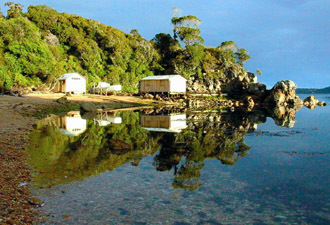 The prospect of seeing Kiwi in the wild is one of the major attractions of this destination. The North West Circuit is a 10-12 day, 125km challenging hike and can be quite demanding due to the often wet and muddy surfaces. 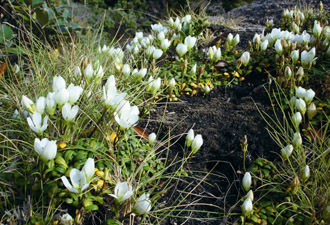 Side trips to Mount Anglem and Rocky Mountain provide views across the Island. The Southern Circuit is a hike of 6-9 days covering 105kms. Side trips to Mount Rakeahua and Rocky Mountain again offer amazing views. Both these walks are challenging and we suggest are only suitable for experienced and well equipped trampers. Remember safety is the responsibility of the individual - research your trip well and leave details with a trusted contact before departing. Know your own limits and take sufficient food supplies. Be aware of the unpredictability of Stewart Island weather. For comprehensive descriptions of walking/tramping tracks, and weather forecasts, you are advised to check on current track conditions at the Rakiura National Park Visitor Centre (Department of Conservation). Safety information can be checked at Adventure Smart.